iBall expanded its product portfolio in India by adding a new tablet in Slide series. The new device is dubbed as iBall Slide i701 and is priced Rs. 4,999. This is the most affordable Windows tablet in the world, claims the company. It will be made available across retail stores and e-commerce sites from today. Mumbai: iBall Slide i701 tablet comes with 7 inch display and the type of display is HD IPS. It is powered by Intel Atom quad core processor. The processor is paired with 1 GB RAM and internal storage is 16 GB. Extra storage can be added up to 32 GB via micro SD. The handset comes out of the box with Windows 8.1 operating system. It features dual cameras but both are only basic cameras. There are 2 megapixel rear and VGA front facing cameras on board. It supports WiFi and Bluetooth connectivity. It only supports 3G via dongle. Battery under the hood is 3200 mAh. “We are extremely elated to announce our latest tablet iBall Slide i701 with industry giants Intel and Microsoft. 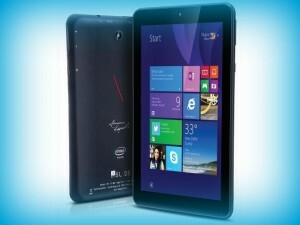 It’s the world’s most economical Windows tablet ever with price tag of Rs. 4,999 only. We are sure every customer will be delighted with this offering,” said Sandeep Parasrampuria, Director of iBall on launching of the affordable Windows tablet. Highlight of the tablet is that there is autograph of Kareena Kapoor’s on the rear panel and buyers can also get HDMI cable worth Rs. 699 and interchangeable protective cover worth Rs. 599 with this purchase. This entry was posted in Launches, Tech on May 21, 2015 by Rakesh.